A flawless white 100-carat diamond has fetched $22.1 million at Sotheby’s auction house in New York. The emerald-cut diamond, originally mined by De Beers in South Africa, has been bought by an anonymous buyer after only three minutes’ bidding. The gem had taken more than a year to cut, polish and perfect. 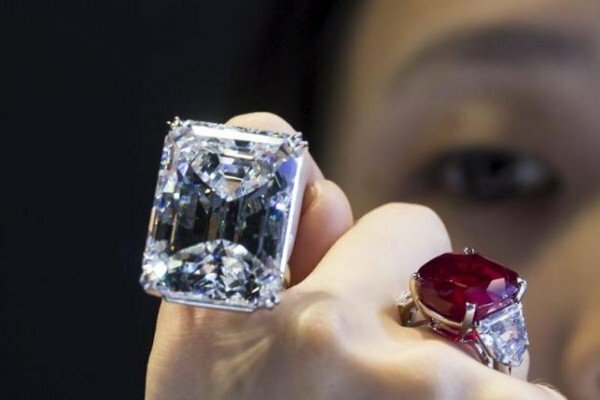 Only six perfect diamonds weighing more than 100 carats have been auctioned in the past 25 years, according to Sotheby’s. The diamond had a pre-sale estimate of between $19 million and $25 million. Gary Schuler, the head of Sotheby’s jewellery department in New York, described the diamond as “the definition of perfection”. “The color is whiter than white, it is free of any internal imperfections and so transparent that I can only compare it to a pool of icy water,” Gary Schuler said before the sale. The gem was the highlight of a sale of more than 350 jewels expected to sell for a total of more than $50 million. In 2013, a flawless pink diamond known as the Pink Star set a world record price for a gemstone at auction when it sold for $83 million in Geneva.